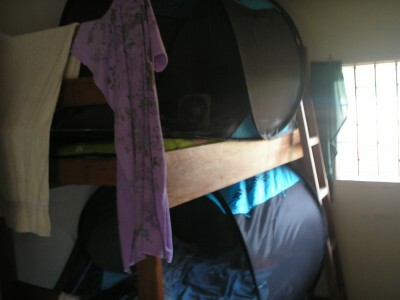 SansBug > Blog > Bed-Bug Tent? will probably not only cause your friends to keep their distance but will also result in many nights of insomnia. So when Amy Terlitsky sent us the email below on returning from Liberia, it was another feather in the cap for SansBug. The super-fine mesh and the sewn-in polyethylene groundsheet offers total protection from bugs. Even if a bed bug hitches a ride into the tent by landing on your clothes or your bed sheets, there’s not much place to hide inside the tent. So if you don’t want to show up for work half asleep and with itchy red welts, look into sleeping in a SansBug tent. The 1-person tent is 86 inches long so it should fit on a bed without a headboard and footboard. The SansBug should allow you to sleep in peace and comfort while you work on long-term measures to control and get rid of bed bugs permanently.